California Institute of the Arts, or CalArts for short, is an arts school located in Valencia, CA. This picture was sent in by DR. 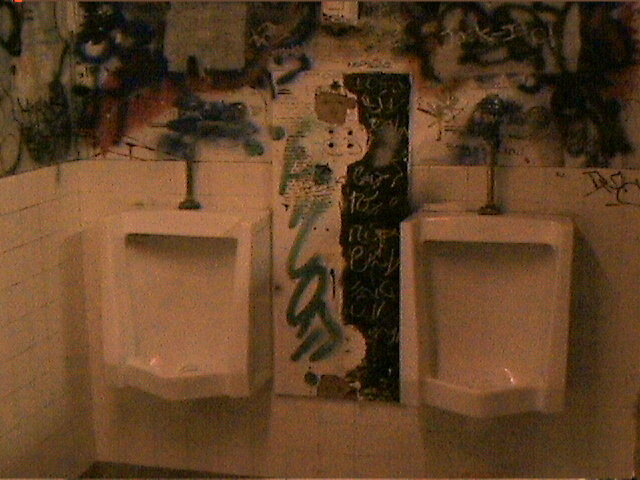 He writes: "The entire basement is covered in graffiti, and the bathroom is no exception. In fact, if you've never been there before, you wouldn't even know if that was the men's or women's bathroom, or even that it was a bathroom at all. Sometimes people write things inside the urinals, unfortunately, nothing was written there when I took this picture".